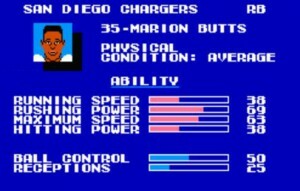 The Chargers found a steal when they reached in the top of the 7th round of the infamous 1989 draft for little known Marion Butts out of Florida State. 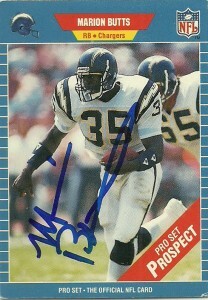 In his rookie season in 1989 he’d come in off the bench during the last 5 games rumbling for 683 yards and 9 touchdowns, including a game in which he single-handedly dominated the Chiefs rushing for 176 yards. 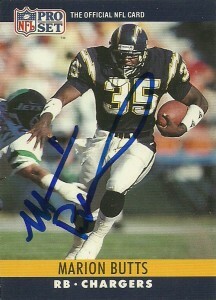 Slipping under the radar when he was drafted, many had pegged Butts as purely a blocking fullback or perhaps special teams hitter (with his 6-1 248 frame) however his style would define the Chargers run game for nearly 5 seasons. Marion’s sophomore season would prove that his surprising rookie season was not a fluke as he galloped for a career high 1225 yards making his first ProBowl. Butts would follow this season up with an additional ProBowl in 1991- but would only start 8 games. 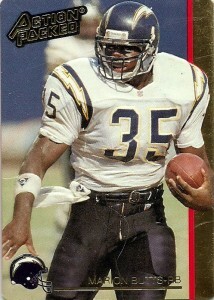 With the emergence of Natrome Means, Butts would play for the Chargers through the 1993 season and finish up his career there with around 4300 yards. 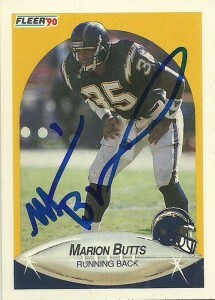 In 1994 Marion would hop over to play for Bill Parcells and the New England Patriots helping the team make the playoffs with his stout running and 1995 would see Marion’s final season played with the vagabond Houston Oilers where he started 2 games and retired after the season’s conclusion. Since football Butts has tried his hand at coaching the sport at the high school level. Marion is apparently a great through the mail signer and although I had to wait sometime, he graciously signed 4 cards for me. 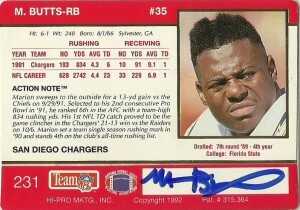 Butts had some great cards, and the ProSet franchise really framed his running style well. The Tecmo SuperBowl franchise represented him well. One of the vaunted and feared ‘popcorn’ runningbacks, (Heyward, Mack, and Okoye also come to mind) you could literally run at or dive at Butts and he would throw you up in the air like popcorn.